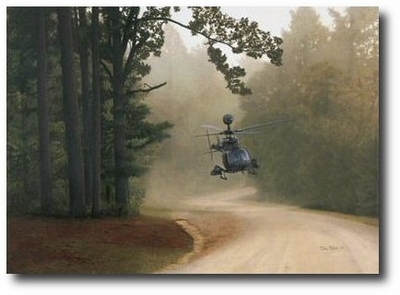 The OH-58D Kiowa Warrior is the US Army's principle armed reconnaissance helicopter. Small in size, the Kiowa performs its functions with a multi-dimensional capacity that has earned it hard-won respect from pilots and ground forces alike. The capabilites of the Kiowa are even more sophisticated than the F-16, and when combined with its agility and highly skilled pilots, its stealth and formidable armaments, the Kiowa Warrior is a very potent asset on any battlefield. 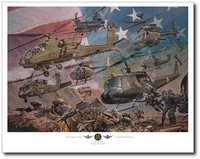 Reproduced on 100 lb Museum Quality Archival Stock and each print of "The Pathfinder" is individually inspected and signed by the artist.